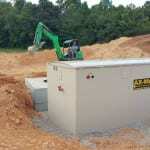 Home > Septic Services Blog > Does Your Commercial Septic System Design Meet Your Requirements? Does Your Commercial Septic System Design Meet Your Requirements? We all know that moment when we need a “fixer” – someone who knows how to solve a problem that doesn’t have an easy solution or that requires expertise. Even the best plans can sometimes lead to unexpected problems that require unique solutions – and that often rings true for commercial business owners. At Southern Water and Soil, we often find that commercial septic system design eludes many septic companies, although they certainly try to get it right. If you are finding that your current commercial septic system is not working for your business, then you can call us as your “fixer” for any commercial septic problems you are experiencing. Not only does commercial septic system design require the use of the proper type of system, but your commercial septic company needs to know how to lay out and install the equipment based on the property size, soil type, slope of the land, and your business’ intended usage. If any one of these things is not addressed in the early planning stages, your business may be set up for septic failure from the get-go. Fortunately, you can always rely on us at Southern Water and Soil to provide complete solutions when it comes to commercial septic system design, even if it means cleaning up after the company before us. We always act with integrity and professionalism and ensure that you don’t experience any further hassles from this important wastewater management system. Contact us today to learn more about our services and to schedule a site evaluation.